I actually finished a project! My plastic Furioso kit is finally done, as a Death Company. This was a pretty easy model to paint, being black ;) Details all went pretty fast. I'm thinking about redoing the blood talons on my other two dreads, but I might keep this one unique. A perfect example of meta-denial, passive-aggressive play that my list was designed around. First, the cyclone missiles were severely neutered, only doing some sporadic frag damage to lootas and boys. The tank-killing speeders were regulated to running and gunning down nob bikers, which is hard to do when I get a 4+/4+ on the warboss against a krak. I didn't want to send the nobs headlong into 20 TH/SS terminators. That isn't a fight they can easily win. But speeders are an easy target, plus taking away any mobility and chance at last-second contesting. Sure it might have seem like a waste of points, but the rest of my list was perfectly suited to deal with his list. Lobbas proved themselves again (of course, good rolling helped) by shaking the whirlwind twice before my nobs could get there and finish it off. It never got a shot off. Niether did the shooty dread..it was always at least shaken or locked in CC. Finally my pull back and shoot, controlling tactics really shone through. I backed up away from the termies, getting an extra round of shooting and getting the assault off. Worked perfectly. The mission didn't help, with only 1 objective, so he had to move to me. The sacrificial boys unit, again worked exactly as it should have. Taking out Belial with the klaw helped a lot there, but it's just the way things worked out..the closest models to each other were him and my nob. But the unit held for the first turn assault, and died in his turn, leaving it open to my shooting. In the end, I couldn't be happier with the way my list worked, and the guy I played was just an awesome opponent. Considering I almost didn't make the game night due to some food poisoning, I had a great time. Getting in a couple games with bike-heavy Orks tells me two things: 1. They can't put up with a lot of shooting, and 2: they are a LOT of fun to play. Zipping all over the board, laying down a ton of S5 shots and still having a punch. I really like playing them, but I'm sure I'll move on after next week. Back to a more solid list, more boys, fewer nob bikers. I might even consider going back to a kan wall for a change. Been a very long time since I've played an Ork vehicle. So as I approach 300 videos, I'm trying to figure out something cool to do. I might do a give away, if I can find something to give away lol.. I really, really don't have any ideas. So tonight is league night, yay! I get to remove myself from reality again for a little while. I find myself needed to escape more and more to fend off depression. Money is super tight and both cars have issues so real life is sucking hard right now. I printed off my super elite bike list, changing the grots to 10 shoota boys. Not sure what I'll play or play against. I just want to have fun. There are still so many things I want to do for youtube. seems like I can't ever focus long enough to get any of them done. I did finally force myself to do the rhino interior videos though, so there is hope! 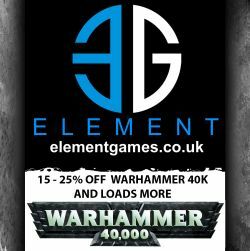 lastly I've been adding videos as content on miniwargaming to enter their 40k contest. So far it's working out great! getting more views all the time. I'll probably add a few videos a day ..maybe even the entire talking about orks series if it continues to go well. originally was going to keep to just the Mek, but ghaz just adds so much to this kind of army it's hard to pass him by. The greatest come from behind ever.. So I tried out my bike list last night, but ended up playing Blood Angels. He of course scouted up both Baals..and then siezed the initiative! I had placed my 2 units of lootas on opposite sides of the table in terrain, the lobbas and boys behind the terrain on my left, and all the bikes in the middle with the warboss on the bikes and wazzy with the nobs. In his first turn, he killed 6 lootas, 5 bikes. I then proceeded to fail all my LD tests (11 twice on the bikes) and they all ran off the table! Ugh! 500pts just gone! I was quite despondent, but I kept playing because, well I still had my nob bikers! My first turn I immobilized and took both TL weapons off the death company storm raven which was right behind the predators in the middle. The bikes moved in an among the preds hoping for a multi-assault but Wasdakka's cannon blew up the flamestorm Baal so I couldn't assault anything. Oh, ya, and the lobbas only did one thing..wound a nob! It was looking mighty grim. His 2nd turn all the DC and DC dread got out of their useless stormraven and everything shot and assaulted the nobs (except the baal, which killed 3 lootas). This is actually where the turn around really started..the way it turned out on the board is that most of his guys ended up in base only with Wazzy. Also having WS5 meant the DC dread was only hitting on 4's, which was a huge help as he ended up only doing 3 wounds before petering out on the talons. Most of his attacks landed on wazzy which died horribly..but also meant most of the attacks were basically lost. My 6 PK attacks blew up the DC dread. The first round ended up a push! My 2nd turn my shooting was ineffective so jumped into assault. I got down the death company to just lemartes. His third turn he had moved the red stormraven around until he got seth and the honor guard into assault range of the boys. Shooting got the lootas down to 5 guys, but they passed LD again lol. The assault didn't turn out well for him, he killed only 6 boys (rolled tripple-1's for seth's wounds) and I killed seth with my PK! Lemartes finally died. My third turn I assaulted the jump pack guys, killing down to 1 man but he held, took the gun off the razorback. Killed off a couple more guys in the honor guard. His 4th turn he shot the lootas down to 2 guys, held again! He threw the 5-man from the razorback (who had FC from red thirst) into the nobs. I killed all 6 models. Down to just 2 guys of the honor guard, killed no orks in return. My 4th turn I blew up the baal pred with my lone 2 lootas with side armor shots, and the nobs wrecked the immobilized dc stormraven. Honor guard finally died. Took the missile launcher off the stormraven. His 5th turn all he had left was a stormraven and a weaponless razorback. The stormraven took out a lobba and 1 loota, but I rolled LD again..double 1's lol. My 5th turn the nob's dakka guns blew up the razorback. Game went on to turn 7, I had taken all the weapons off the stormraven and it was SMF'ing around the board doing nothing. Final tally: Orks 9 killpoints, Blood Angels 4 killpoints. My dice got pretty hot, making a whole crapton of armor/invul/FNP saves on the nobs and his got cold, especially when trying to wound. I still think the biggest moment of the game was the first DC assault when half his unit was rendered useless by being only able to attack the IC. Next week I will probably be up against the Mechdar I thought I would face this week. I might take a very, very strange list..or Tau. So tomorrow is another league night. I will most likely be playing mechdar or deathwing. Either one does not sound like fun, so I might run something completely unorthodox and be an easy win for someone! Lots of speed, lots of shooting @18". The idea with this is control. Control range, control areas of the board, control assaults. Use my speed and firepower to keep the game going as I want. No idea if any of it will work, but I'll be running all over the place trying! Either that, or I'll run the same list I did last week. Also finished my grots. I now hae 33 grots, 4 ammo runs, 1 grot oiler and one grot orderly plus 2 runtherds. I should have enough to run a unit plus a couple units of big guns. Finished my 8th Nob Biker tonight, the one with just a big choppa. So I thought I'd get them all out, hit them with some dul-coat and take some pics. What can I say, I'm really liking Nob Bikers. Also a couple pics of my last two, the kombi-skorchas..one with PK one with BC. Also did 5 of my 10 grots for the April Freebootaz challenge. Just need flock. Using the wash technique they go so fast! A bit of fun for the night..
Last night I was painting and my daughter asked if she could paint. It was too late, but tonight I got out some guardsmen that was in my Tau army when I bought it. I tried to help them out a bit but basically just let them go and have fun. Recorded some of it on video too. was a fun and relaxing evening. Sometimes 40k can come down to matchups. Some armies play well or have weaknesses against certain builds. Last night I got to come up against what I would call the "nightmare" build vs my army: Grey Knights with all Purifiers. Purifiers, if you don't know, have a power "cleansing flame" that every model in the combat with them takes a wound on 4+ before combat begins. Not models in base contact, but all models...and the wounds count toward combat res! I can't think of anything worse for Ork Boys. Even though I played a smart as I could, I still could not avoid getting boys stuck in. It basically only happened once but that was still enough to kill 11 out of 18 boys in the combat. I knew I had whittled down the unit enough to wipe them out, which I did, but it was at a heavy price. Purifiers are guys that MUST be shot not assaulted! Combined with massive psycannon shooting really took a toll on the boys. Against the poison-heavy Dark Eldar at least I can still get in assault with whatever boys remain and have a darn good chance of winning..not so much against Purifiers. I think I actually got distracted by spending too much time worrying about controlling assaults. The psybolt-ammo rifleman was a big problem against the nob bikers with those S8 shots..I should have shot that first, before the rhinos, because it did a good deal of damage. I only blew it up after Nobs were already in assault. Paladins also present a problem. The thing is though, Orks is pretty much the only army that will have a problem with them. Anyone able to pack melta or lascannon fire won't be worried about them at all, so hopefully we won't be seeing them all that often. What's better then Nob Bikers? I'm taking the 1500pt list I played in the tournament and adding 2 more nob bikers and more lootas. I had a few points left over, so I added a runtherd to the lobbas. 1750pts, 8 killpoints. Love it. Yay I got in a game of Fantasy! Went over to Western Oregon Wargamers Sunday for Ordo's fantasy game night. I have not been there in a while, but I felt like dusting off the Vampire Counts. Only played 1250, which is a strange point level for WFB but it was still a lot of fun. I got to watch a couple games going on before I played. I played vs a goblin list with 2 big blocks of goblins, a combat lord, a shaman, and a hero BSB, and one of the new spiders. I continue to forget about my banner of barrows. For like 3 or 4 combat rounds I forgot not only to use it (I would have been hitting on 2's with re-rolls) but also forgot about the re-rolls from vanhels! lol. By then it was too late as 1 unit of ghouls and my grave guard had been ground down by the spider. One epic fail was near the end. I had just the ghast left against the spider and one unit of goblins. I got off 3 neheks and rolled a 1 for all 3! sigh. In the end I was able to charge and wipe out the unit of goblins with the lord and bsb, giving me a narrow 800-675pt win. It was a great game. I really, really like the VC magic phase able to cast over and over again. Having the 2nd caster was a huge benefit. SMA Contest is going on again! Last year I entered a Vendetta in a contest at Scale model addict. Didn't win, but I get a random prize of some nice airbrush paints for military models. Well It's starting again, today in fact, and ends in 2 months. I'm thinking about looking a tank kit I have into a wartraxx.